The 27th King’s Cup World Championship kicked off at 9 am, Monday 2nd July and ran all week. The Championship started with the doubles competition, with Australia in the Division 2 pool with Iran, Brazil, France, Macau and Bangladesh.By the end of Day 2 Australia had won against France, Macau and Bangladesh, and lost (just!) to Iran, reaching the Doubles semi finals with Brazil. It was close fought – Brazil defeated Australia in 4 sets 15-7, 9-15, 15-8, 15-11. On Wednesday 4th July, the finals of all Championship doubles were held and Iran beat Brazil in the Division 2 final. And the high profile regu competition started, with three players a side. Australia, again in Division 2 but with a slightly different pool, won both its regu matches against France and Bangladesh but lost against Brazil, and lost, but still qualified for the Division 2 regu semi finals match against Iran. In the semi final Australia gave Iran a run for its money, but lost 15-11, 15-7, 15-7. An awesome effort in achieving bronze medals for the Division in both competitions! The Australian players are three Darwin men – Alex Newman (captain), Daniel Ellen-Barwell, and Sakharet Sanensuk (Tang). The team was accompanied by Steve Svensson, an Australian Association committee member with long standing contacts in international sepak takraw. This year Alex and Daniel maintained their intense training schedule in Bangkok with the Bangkok Youth Players. under the guidance of renowned coach Veerachai Jantagulmana, and with the support and endorsement of the Head Coach of the Thailand National Sepak Takraw Team on behalf of the Takraw Association of Thailand. Tang continued his training in Darwin and joined Alex and Daniel for an intensive week before the Kings Cup. 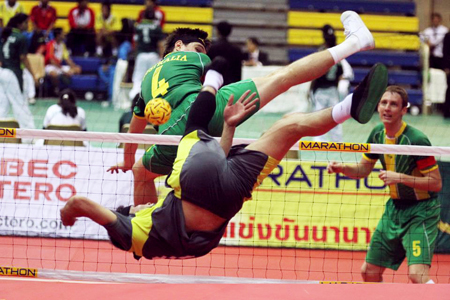 The Australian Sepak Takraw Association is immensely appreciative of the special guidance given to its squad in Thailand, and their efforts have shown spectacular results.